In my humble opinion, there's never a bad time to throw down a heaping plate of hearty peanut stew, black eyed peas and spinach...which is exactly what I'm doing as I write this Togolese entry. My forlorn laptop is embarrassingly covered with sticky finger prints, flour, and now peanut butter - but it's all good! Deceptively easy to prepare, this stew is both healthy and tasty, as the chicken breasts are steamed, then added to a lightly sauteed combination of onions, garlic, a dash of hot pepper flakes, tomatoes and peanut butter. If you're interested in West African cooking, and want to try an easy dish, this might just be the one for you. I opted not to serve it with rice, but traditionally, it can be accompanied by white rice, couscous, plantains, or any combination of beans, leaf greens or okra. 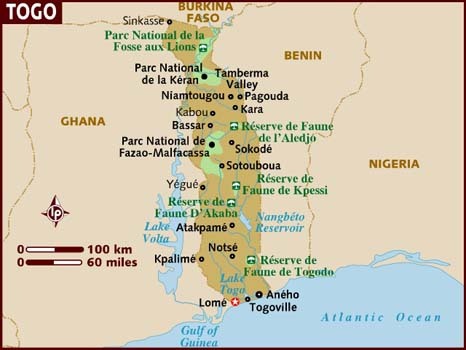 A narrow country on Africa's west coast, Togo is bordered by Ghana, Benin and Burkina Faso. Formed as part of the slave coast from where captives were shipped abroad by European slave traders during the 17 century, Togo became a German protectorate in 1884. At the start of WWI, Togo was seized by Britain and France, divided and administered under the League of Nations Mandates. The British ruling the western part and incorporating that area into what is now Ghana. In 1960, Togo gained independence, but civil unrest, controversial elections and the assassination of the country's first president led to coups, civil rights violations and the devastating loss of innocent lives. Togo's climate is sub-Saharan and provides a good growing climate, which supports agriculture as the country's primary form of revenue. The official language is French, but Gbe is largely spoken as well. The majority of religious sects are indigenous, followed by Christian and Muslim believers. Ethnic groups include Ewe, Mina Tem, Tchamba and Kabre. Cuisine in Togo has both indigenous and Colonial roots. For example, German beer and baguettes are regularly enjoyed. Food is mainly spicy and colorful, with maize widely eaten as pate, served with spicy sauces, meats, smoked fish, thick peanut-based or tomato stews. Aklui porridge is widely eaten for breakfast. Vegetables and starches include, okara, ademe, spinach, beans, black eyed peas, fufu (boiled, mashed yams), cassava and plantains. And of course, peanut chicken. I served the stew with steamed baby spinach and black eyed peas ~ right on! 1. Boil 1/2" of water in pan. Add chicken, cover, and steam 12-15 minutes. 2. Drain chicken and shred it with 2 forks on a cutting board. 3. Meanwhile heat oil in frying pan. Saute onions and garlic about 6 minutes, until translucent. 4. Stir in shredded chicken, tomatoes, and peanut butter. Heat 5 minutes. 5. Serve with rice, black eyed peas and spinach. I had to mark this as funny, because we picked the EXACT SAME THING TO COOK!!! LOLOLOL! That's why I told you on FB that I wasn't going to read this until after I cooked tonight!! Great minds think alike...and I have to say that yours looks a lot more appetizing than mine does and I did use the rice. I used some frozen swiss chard from my garden instead of spinach. Great blog, Sarah, I'm totally linking to this on mine tonight!! First on seeing the topic i wondered how come spinach goes with chicken ??? But spinach isn't cooked here so does it gives bitter taste ?? I just blanched the spinach to keep it nice and green, and it's baby spinach, so not bitter at all. Hope all is well, and thanks for stopping by!